I was gripped by the character of Lisbeth Salander, and not only because of the mesmerising acting by Noomi Rapace. I couldn’t help wondering what her Myers-Briggs Type Indicator would be. And I suspect INTP. Others think INTJ. But INTJs “tend to plan their activities and make decisions early; they derive a sense of control through predictability”. Yet I think she “tends to withhold judgment and delay important decisions, preferring to ‘keep her options open’ should circumstances change”, which is INTP. (I also felt a connection with the character of Saga Norén in the Danish/Swedish TV series The Bridge. But her pedantry arose because she lacked empathy, and Asperger syndrome was assumed). I’ve just read a super article by Valerie Tarico about the challenges that the Internet (and especially the Web) poses for religion: Religion may not survive the Internet. It reminded me of an article (that Valerie Tarico won’t have seen or known about) that I wrote on my website some time ago: Religions in future. Future generations will grow up exposed to global information sources which will challenge the beliefs of their parents and local communities. This process has already begun, with the rise of services on the web starting in the 1990s. A recent example is YouTube Atheism. Evidence about the nature of religion in general, the origins of specific religions, and the nature of the universe continues to be made available globally. It becomes harder each decade to sustain ideas about “the one true religion”, with consequential assumptions about the characters (eg. morality) of people (religious or not) who refute that religion. This is because of increased contact with other people, and increased exposure to global information sources. Science continues to reveal the similarity and continuity of human beings through history and across the world. Global communications shows how many of the problems people face are the same across the world. There is no such thing as “new atheism”. Instead there is a “new context” (“new audience” and “new media”) which has changed the perception of “existing atheism”. Examination of Jack Huberman’s “The Quotable Atheist” shows that nearly all the themes in the latest set of books were present in earlier works. Also, the language of many of those earlier expressions were at least as disrespectful of religion. Suppose that Richard Dawkins had had an outline of “The God Delusion” in earlier decades – 1996, 1986, 1976, …. Would there have been sufficient incentives for Richard to expand that outline to its current comprehensive version, rather than release it in more limited form? Would there have been sufficient incentives for a publisher to publish it as widely and as well-translated? What would the reception have been? For example: 1996. The web existed, but was not widely used. There were no web forums, no video-viewing such as YouTube or video downloads, little or no on-line publication of news articles, etc. There were fewer TV stations available to most people in the UK, probably less need to find material to fill the air-time, and perhaps less need for controversial material to attract viewers. Another factor in 1996 was “this was pre-9/11″. That influenced some of the content of the book and surely changed the audience. Given all of this, how far would people have taken an interest in even the comprehensive version? Surely far fewer people would have been aware of it, and there would have been fewer opportunities to debate it? Would people even have been talking about “new atheism”? This sort of analysis could be extended to earlier decades, and to all of the current set of books. Rather more speculative, how will the current books be viewed in 2016, 2026, …? And what will new books about atheism, perhaps written by a new and less restrained generation, be like in those years? Will the “conversational climate” have changed so that the current books will be seen as quite mild, with new books being more aggressive? There are religious people alive today who will still be alive and religious at the end of the century. Religions will be around for centuries. We are engaged in a war for enlightenment being fought over generations. Indoctrination of children who do not have the knowledge and maturity to resist. Reinforcement of that indoctrination by daily, weekly, annual, and life-stage events. Religions don’t have the means to convert most mentally competent adults, hence the need to start with children. Global communication can disrupt or reverse both of these techniques. A better measure of the effectiveness of atheist literature than whether it de-converts religious adults is whether it prevents children growing up to be religious adults. Lots of people talk about “the baby boom”. Lots of people make claims about “the baby boomers”. Here are some of the myths held by lots of people. I have written this article as though I am having an informal argument with you about these myths. I accept that you may not believe them all, or indeed you may not believe any of them! Please forgive my style. Here is the UK population at 1985, showing people born in the years 1935 to 1985. It is ridiculous to choose the range 1945-1965 as a “baby boom”. 1965 was obviously near the peak of a baby boom! (All graphs in this article use the female half of the Population Pyramid. This slightly exaggerates the size of older groups because on average women have longer lives. They have linear Y-axis with origin zero so they accurately indicate the relative populations at different birth dates). If you really need to talk about baby booms, (but why? ), it makes more sense to talk of two baby booms in this period, as below. 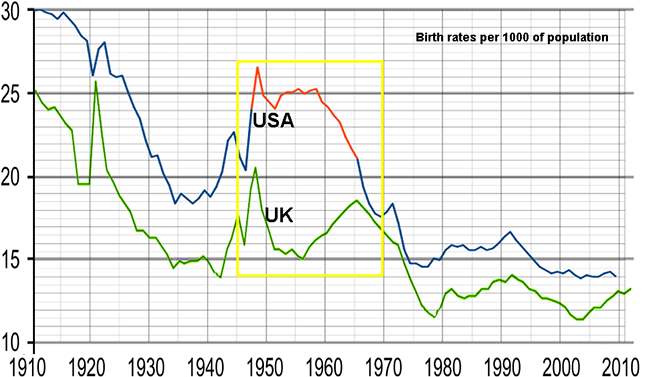 The ranges are somewhat arbitrary, although the 1946 peak is unambiguously the start of a short post-war baby boom. Although people call these “booms”, the peak at 1946 was less than 28% higher than the value at 1945, and the peak at 1964 was less than 30% higher than the value at 1954. This caused problems for maternity wards in hospitals and classrooms in schools, and puts a strain on housing. But the overall political influence once they could vote is small and diffused. There were about seven 10-year cohorts in the electorate to be satisfied. There was no cohort that simply had to be appeased at the expense of the others. Even every 24-year cohort was a minority! And the same applies to every other general election. From 1983: The 1945-1965 electorate as a percentage of the total electorate has been decreasing because they are dying and the total electorate is increasing. There appear to be cases where being in a large cohort is a disadvantage. Some improvements can’t be afforded because too many people would have to be helped. The expected rise in the tax threshold for pensioners was not provided in the last budget. A new higher flat rate state pension is proposed, but it won’t apply to existing pensioners. The Dilnot proposal for a cap on pensioner’s long-term care is floundering, and if implemented at all will probably be inadequate. This is like a fart in a lift; it is wrong on so many levels! First: even if baby boomers could manipulate political and economic factors, what is “in their favour”? At any election, the oldest and youngest people in a 20-year cohort have reached different life-stages and want different and often contradictory things. The wider the age-range of a group, the less they will have in common. All the women born in 1950 and earlier were already entitled to their state pensions. They wanted favours for pensioners. The oldest men in the cohort were just starting to be entitled to their state pensions. They didn’t want any disruption to their entitlement date, and also wanted favours for pensioners. But the youngest men and women in the cohort were in their mid to late 40s, and wanted lower taxes and favours for working people. They didn’t want to pay a lot towards older people’s state pensions. 1979 (Margaret Thatcher) Age 34. Working. Living in first house with mortgage. Raising a family. Age 14. Still at school. Not old enough to vote. 1992 (John Major) Age 47. Working. Children leaving home. With mortgage. Age 27. Working. Buying first house with mortgage. Starting a family. 1997 (Tony Blair) Age 52. Working. Children left home. Probably with mortgage. Age 32. Working. Living in first house with mortgage. Raising a family. 2010 (David Cameron) Age 65. Retired. Collecting state pension. Mortgage paid off. Age 45. Working. Children leaving home. With mortgage. 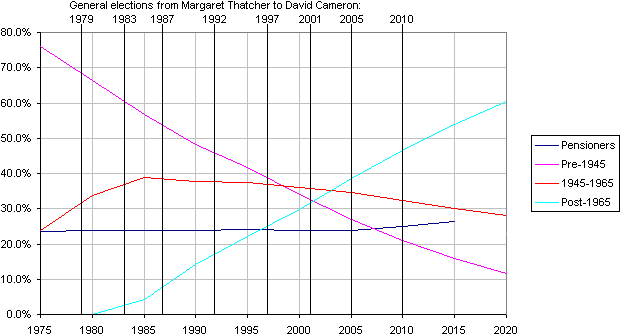 From 1979 (Thatcher) to 2010 (Cameron), general elections have been at 4 or 5 year intervals. So a 20-year cohort corresponds to at least 4 general elections. Whatever the older people in the cohort want in a particular general election, the younger people in the cohort will probably want the same about 4 general elections later, by which time the older people will want different things. (When they have all become pensioners they will want some of the same things, but they will still have differences in health and wealth which will influence them in different directions). Second: Obviously the political views of any cohort will be spread from left to right. They will have a spread of health, education, wealth, housing, region, family connections, and lots of other relevant parameters. They will have different degrees of political and social awareness and activism. These are likely to be at least as important as their cohort, partly because there is typically no loyalty to a cohort. Third: how did baby boomers manipulate political and economic factors? Even had they all wanted the same things, they couldn’t manipulate things simply by voting. The Party Election Manifestos didn’t offer options designed to appeal specifically to baby boomers. Scattered among all the other promises were occasional nuggets, for example the promise of free travel for the elderly in the 2005 Labour Party Election Manifesto (PDF). But most of the people who voted Labour in 2005 were young; older people mostly voted Conservative, which didn’t make such a promise! And even if free travel still exists in future, it will be 1925 before all of the 1945-1965 cohort are qualified, so the younger people in the cohort had no reason to want free travel in 2005. This promise was really directed at people born before 1945. There weren’t lobby groups specifically for baby boomers. Baby boomers didn’t conspire to manipulate the outcomes of elections. Probably fewer than 1% of them ever had their hands near the levers of power. Nearly all of them were living in a country where things happened that they didn’t fully understand, doing the sort of things that other generations do. They weren’t doing things they shouldn’t have done, or failing to do things they should have done. “The baby boomers caused Wilson to provide the Abortion Act”. The Abortion Act was 1967, and the voting age then was 21. Only people born in 1946 and earlier had a significant influence on the government. NHS abortion wasn’t provided because the baby boomers wanted it; it was provided for humanitarian reasons, to reduce deaths and injuries in women resulting from back-street abortions. 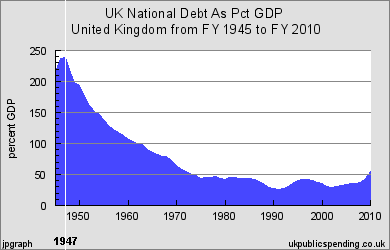 “The baby boomers caused Thatcher to break the pensions index-link in the early-1980s”. When Thatcher was elected in 1979, only baby boomers from 1945 to 1961 could vote, only 33% of the electorate. Pensioners were about 23% of the electorate, so the pre-1945 non-pensioners were about 44% of the electorate. Why not blame them instead (or as well as)? “The baby boomers caused Blair to provide free travel in about 2006″. Free travel for people at least 60 was in Blair’s 2005 manifesto. In 2005, the people at least 60 were those those born in 1945 and earlier. This was an electoral promise for the pre-baby boomers! “The baby boomers caused Cameron to remake the pensions index-link after the 2010 election”. Most of the baby boomers were still working, and years away from being pensioners. The youngest baby boomers were in their mid to late 40s! And the post-baby boom electorate was significantly larger than the total baby boom cohort. This is perhaps the silliest myth of all! What does this statement mean? If someone told you to steal your children’s future, what would you do? If someone told you to stop doing it, what would you stop doing? What have those children lost? Years of their life? Modern medicine? Modern technology? Greater education opportunities than baby boomers? Oh – they still have those! It is valid to blame someone only if they did something they shouldn’t have done, or didn’t do something they should have done. And “should/shouldn’t” implies knowledge of the consequences and the ability to change those consequences. It obviously doesn’t imply simply “living in a country where, in retrospect, unwanted things happened” nor “living in a country without power to change things for the better”. This myth is a unjustified slur by people who should know better, presumably as a cynical way to sell books. It confuses “correlation” with “cause and effect”, and so fails to describe why things happened, therefore is of little use in solving problems. “But what has caused this – intergenerational inequity or the catastrophic failure of neoliberal economic policies over the past thirty-five years? The former explanation masks the latter and, in its most extreme version, argues that one particular ‘welfare generation’ has manipulated the public policy agenda in its own favour – covertly, concertedly and conspiratorially. In this form, it is a human agency explanation reductio ad absurdum, with little cognisance taken of structural economic factors. It remains unsupported by any convincing evidence from policy-making case-studies…. Third is the claim that the baby boomers comprise a uniquely selfish ‘welfare generation’ which has gone through life at every stage absorbing a disproportionate share of public resources, and has ended up in old age with ‘over-generous’ provision (particularly in regard to state pensions). However, complaints of this nature were not made when the baby boomers were younger…. “Even at the level of averages, a quick glance at the baby boomers shows that their path through life has not been all gain. Maria Evandrou has made the simple yet effective point that the first wave boomers were born into austerity but reached maturity in times of relative prosperity; with the second wave boomers, it was the reverse. Just taking those born at the peak of births, in the late-1940s, we can see that they experienced higher infant mortality, lower average family incomes, large class sizes in school and much poorer results in public examinations compared with schoolchildren today. Only five per cent of this birth cohort went to university. These peak boomers were becoming established in the labour market in the late 1960s, when unemployment was low, but they then experienced rising unemployment and inflation in the 1970s, when membership of occupational pension schemes was beginning to decline; and from 1980 the state pension fell in value relative to average earnings. They are now entering retirement at a point when returns from savings are lower than inflation: little wonder that increasing numbers of them have had to postpone retirement and continue working past state pension age. All in all, they do not seem to have been very adept at manipulating the public policy agenda in their own favour…. “Despite some pioneering work by John Rawls, Bruce Ackerman and a few others, moral philosophers have given surprisingly little thought to the question of age as a social division and the problem of distributional justice between age cohorts, tending instead to assume fixed populations over short time periods…. Allegations of intergenerational inequity thus lack a clear theoretical underpinning…. I have been gradually adding to an earlier article “Baby booms in the electorates of the last 6 Prime Ministers“. The latest addition warrants this article of its own. 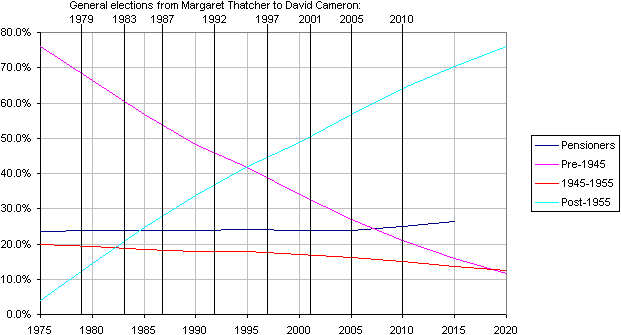 The context is that the above article shows the population and electoral graphs for Prime Ministers from Margaret Thatcher in 1979 to David Cameron in 2010. One objective was to show that the 1945-1965 cohort didn’t dominate politics and elections over the last few decades.